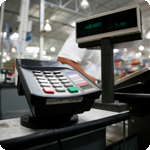 Retail merchant account rates are notoriously high. We can show you how to keep your rates low. Security, multiple payment options, and customer retention are just a few of the payment processing issues retailers must consider for long term success. The Interchange pass through rates you see above are some of the most common cards used in a retail environment. Cards assessed at a higher rate will be passed through at true cost with no hidden fees. For the most current Interchange chart please click the pdf link below or contact one of our Interchange experts for training.